Definition: Real wage unemployment occurs when wages are set above the equilibrium level causing the supply of labour to be greater than demand. 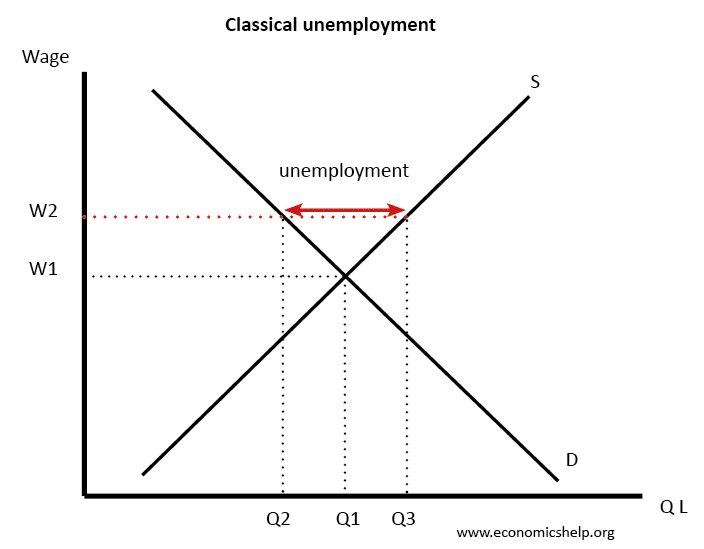 Classical unemployment of Q1-Q2 caused by a wage NMW above the equilibrium. Classical economists argue the solution is to cut wages to reduce unemployment. 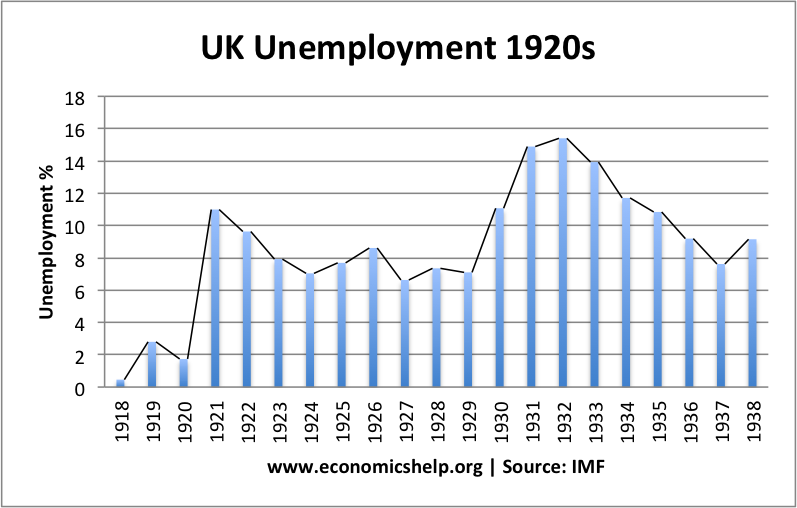 For example, a fall in demand for labour (due to demand-side shock) could cause unemployment, if wages are kept at their old level (W1). If labour markets are made more flexible, wages would fall to We and equilibrium would be restored at Q1. But, if wages are ‘sticky downward’ then wages will stay at W1, and we will get classical unemployment of the difference between S and D.
To what extent does the level of nominal and real wages influence the rate of unemployment? The basis of classical economics revolves around labour markets and the assumption of labour markets which perfectly clear. One fundamental idea is that wages above the market clearing equilibrium will cause unemployment. Some economists go so far as to say all unemployment reflects disequilibrium in the labour market. – If wages were allowed to fall to the market clearing level, then unemployment would be solved. Therefore classical economists place great emphasis on reducing the power of trades unions and legislation which leads to artificially high real wages. Would cutting wages solve real wage unemployment? 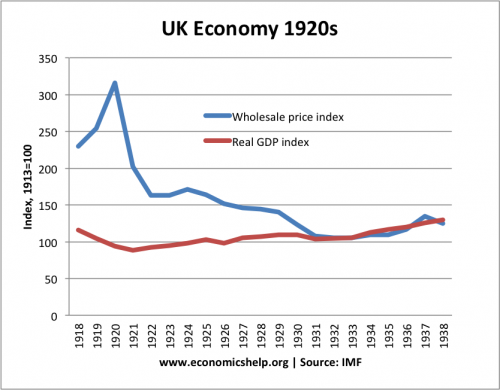 However, other economists, such as Keynes argue that cutting wages is not such a simplistic solution. Firstly, in a recession, if you cut wages, it will cause a fall in spending because people have less income, this will reduce aggregate demand and therefore lead to lower economic growth. This, in turn, will lead to less demand for labour. Keynesians stress the need for governments to boost aggregate demand, rather than relying on wage cuts. Secondly, classical economists make the assumption that labour markets are perfectly competitive. However, in the real world, there are many labour market imperfections such as monopsonistic labour markets. This means cutting wages may not boost demand for labour. Unemployment has various causes, we cannot reduce it to a simple case of real wages always being too high. 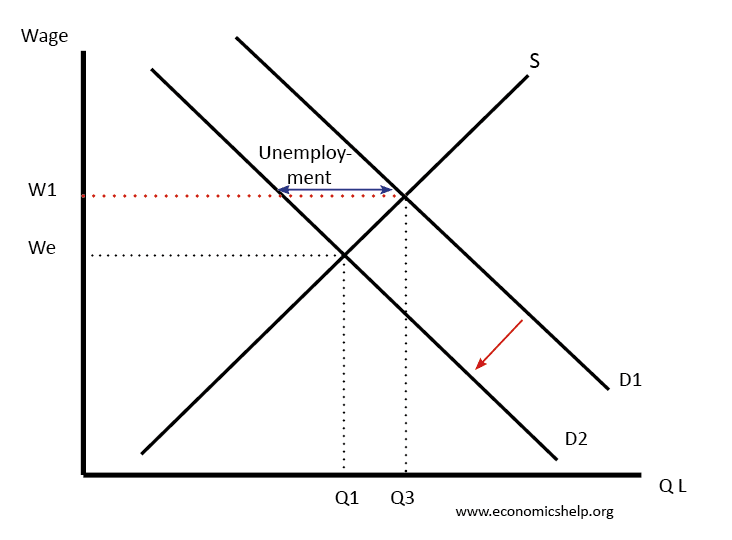 For example, the unemployment could be structural or frictional. Nevertheless, if wages are artificially high, it is likely to contribute to unemployment. For example, a feature of the Great Depression was policies by both Hoover and Roosevelt increased the power of trades unions creating real wage unemployment at a time when unemployment was already high due to cyclical factors. Real Wage Unemployment is more of a problem in a period of deflation – falling prices. This is because falling prices may require falling nominal wages to prevent real wage unemployment. But, it is a cut in nominal wages, workers are most likely to resist. This is another problem of deflation. In the 1920s, there was also a 13 percent fall in the normal working week without any compensating adjustment in the weekly wage. I agree with most of the above. But I don’t think you disparage what I would call the “simple minded” supply/demand chart above strongly enough. This chart essentially applies a micro economic idea at the macro economic level: nearly always a blunder. Thus if wages are excessively high, then profits must be too low. This in turn means an insufficient number of entrepreneurs doing their stuff, which in turn means an insufficient number of jobs being created. Note that this is all macro-economic. Possibly this actually happened in the 1970s when UK trade unions were continuously harping on about profits being too high, and using this as justification for wage increases.